When the Beatles showed up for the film premiere, throngs of fans turned out to catch a glimpse of their heroes, blocking the streets and bringing London traffic to a standstill in the process. It was one of the last huge public displays of Beatlemania in England. The Beatles appearing in a cartoon movie came about to satisfy a contractual obligation they made with United Artists. They had signed a deal with the company to make three movies and delivered “A Hard Days Night” in 1964 and “Help!” in 1965, but still had one more hanging over their heads. The animated Beatles were based on their appearances in the “Strawberry Fields Forever” promo film released in 1967 (except Paul was sans mustache). The film’s art director Heinz Edelmann was responsible for its lush, psychedelic imagery that meshed perfectly with the soundtrack of mid-period Beatles songs. The story was written by Lee Minoff based on the Lennon and McCartney song. The plot plays second fiddle to the music, and most of the film is a series of set pieces of Beatles songs accompanies by cool imagery. The tale told in between is almost incidental, but entertaining nonetheless. Professional actors voiced the characters of the Beatles. It turned out that Peter Batten, who provided the voice for George during the first half of “Yellow Submarine”, was a deserter from the British Army and was arrested midway through the making of the film. Paul Angelis, who was doing the voice of Ringo, took over as George after Batten’s sudden departure. 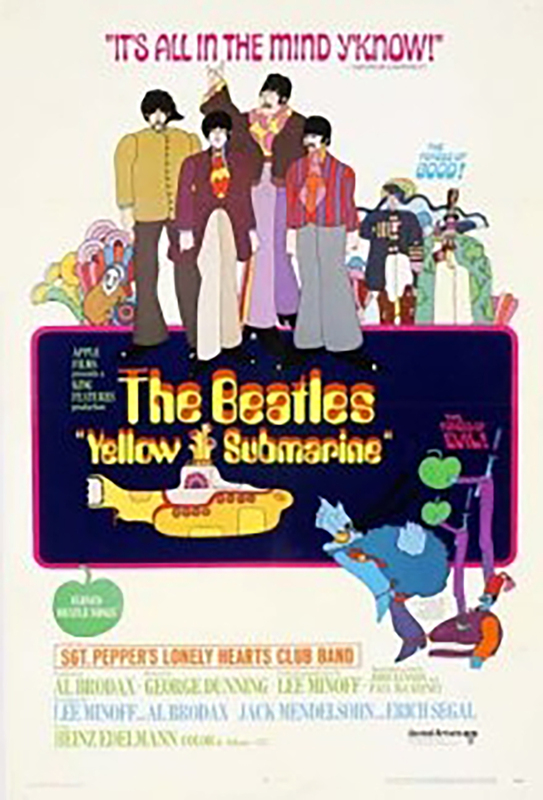 “Yellow Submarine” was a huge hit with audiences worldwide. The Beatles themselves loved the movie. George Harrison called it a “classic.” Ringo Starr said that for years children would ask him “Why did you press the button?” in reference to when the cartoon Ringo inexplicably pressed the panic button in the yellow submarine, ejecting him into the Sea of Monsters. John Lennon remarked that his son Sean found out about his Beatle past watching “Yellow Submarine” at a playmate’s house. He came home and asked John why he was a cartoon. “Yellow Submarine” may not have achieved the Beatles’ goal of fulfilling their obligation to Untied Artists, but it gave us all some fantastic eye – and ear – candy.